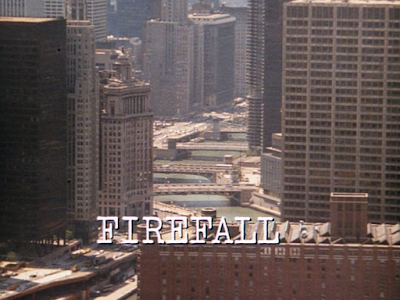 In “Firefall,” Kolchak (Darren McGavin) follows the unusual case of a local symphony conduct, Ryder Bond (Fred Beir), who seems to be the culprit in a series of arson murders. On further examination, however, the journalist realizes that the murders may actually be a result of spontaneous combustion, or some supernatural attack. Digging deeper, Kolchak learns that a gangster’s death at a local arcade some time earlier may be the key fact explaining the crimes. When the gangster, Markoff, died, his spirit became a “doppelganger" and began to murder the friends of Bond, in an effort to take over his life. He has selected Bond as his target because his life-long love of the symphony. Now, alas, the doppelganger is out to kill Kolchak, a task that can only be accomplished outside of a church, and if Kolchak falls asleep. 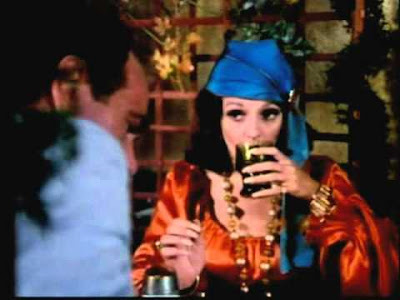 Kolchak seeks the help of a gypsy fortune teller, Marie (Madlyn Rhue), to help him destroy the terrifying doppelganger. He learns that he must take the doppelganger’s corpse to the place of its death, if he wishes to vanquish this foe. 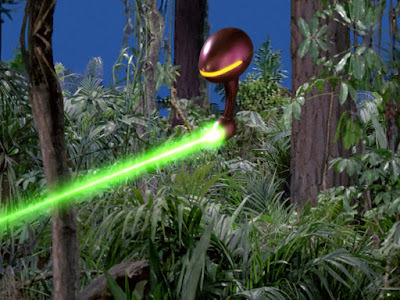 “Firefall” is the best Kolchak: The Night Stalker (1974-1974) episode since “The Zombie,” which is unusual since the monster of the week, a vengeful spirit, is less colorful, perhaps, than a vampire, a werewolf, an alien, or Jack the Ripper. The episode fits the same formula that viewers will detect in all the episodes, from the hostile authority figures (usually police officers) to the local “color” that is on-the-take, here Rhue’s amusing gypsy. And yet the story works well, for two reasons, primarily. First, the doppelganger is legitimately scary. There is a scene here in which the spirit peeks inside at Kolchak and Bond through a church window, smiling malevolently. There is a sense from the monster’s expression that he is feeling tremendous joy from torturing Kolchak and Bond. This villain is downright sinister. So, in addition to being alone in his quest, Kolchak must battle his own exhaustion as well as the monster of the week. 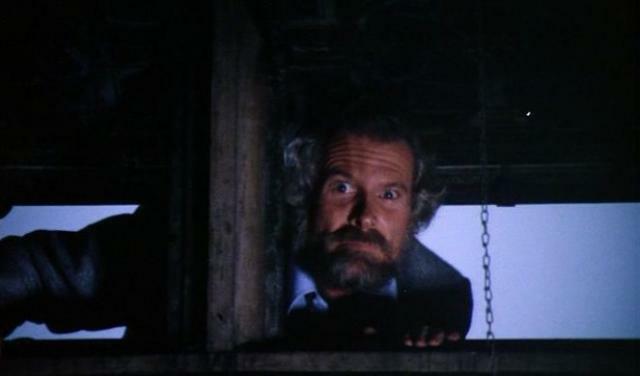 The episode’s finale finds him finally letting down and falling asleep…in the back of a police car as he is hauled off to jail for arson himself. I would love to know how Kolchak evaded this charge, since he is directly responsible for the fire that destroys the arcade. And speaking of that arcade, as a fan of vintage games, it is a pleasure to watch this episode and see the pinball machines and other attractions at an arcade in America, circa 1974. 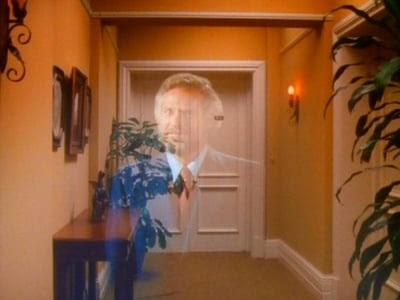 The special effects this week depicting the doppelganger's spectral form are about as weak as we've come to expect from the series, but somehow don't take away from the urgency of the narrative. Finally, “Firefall” seems to take on a slightly Columbo-esque bent this week, as Kolchak develops a closer-than-usual, bicker-some relationship with the would-be victim of the monster, the haughty Bond. In both situations, a crumpled, slightly biarre (but brilliant) character, digs for the truth while hunting the perpetrator of a crime.